One place in particular serves down home southern cooking. The last time I went was with a group of women and they started talking about this cornbread salad that used to be on the menu. So, of course, I whipped out my phone and googled to see what they were talking about. What I found was so similar to the Doritos Taco Salad I love so much that I had to try it as soon as I got home. Instead of the traditional use of ranch dressing I used my old standby of Thousand Island and Catalina dressing combined. This salad was so good and definitely something I would make for a gathering or just to nosh on. It is that good! Make cornbread according to package instructions for an 8×8 pan. Let cool. Cut into 1 inch cubes. In a large frying pan, brown hamburger meat. Drain oil then add the taco seasoning and make according to instructions. 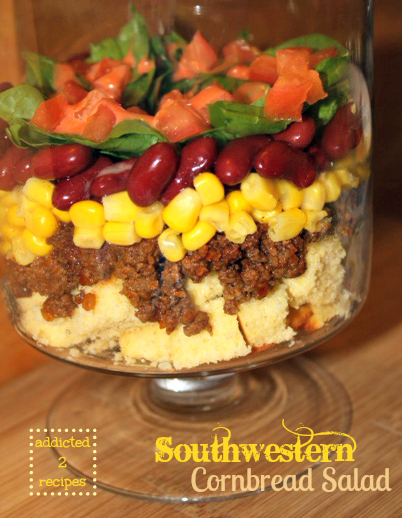 In a trifle bowl or large serving bowl begin layering by covering bottom of bowl with cornbread cubes. 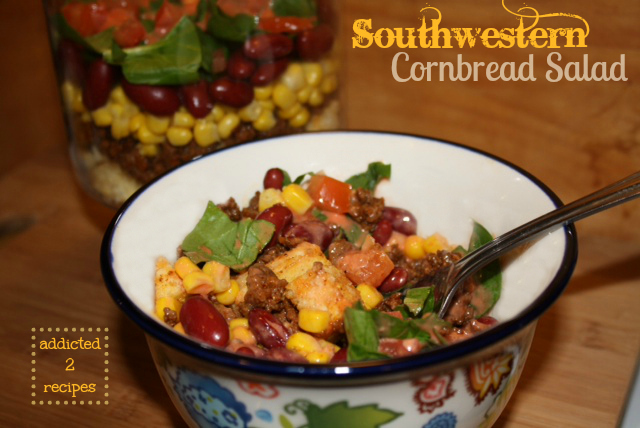 Top with hamburger meat, then corn, then kidney beans. Top with cut spinach leaves and then add diced tomatoes. In a small cup, add together Thousand Island and Catalina dressings. Mix well to combine. Drizzle dressing over the salad and serve immediately. You can also add onions, bell peppers and cheese to make it even more amazing.